It’s funny, whenever I’m trying to come up with a quick, easy, and healthy meal I always default to Greek food. Is that weird? Case in point: potato gyros, greek salad, greek dip, quinoa salad. It’s a pretty versatile genre not to mention healthy and inexpensive. It also can easily be converted into a vegetarian meal – just omit the meat. This recipe is particularly easy because many of the elements can be prepped in advance. The veggies can be cut up and stored in tupperware, the chicken can be grilled and wrapped up tight in the fridge, and the onions can marinate for days in advance (instructions here). 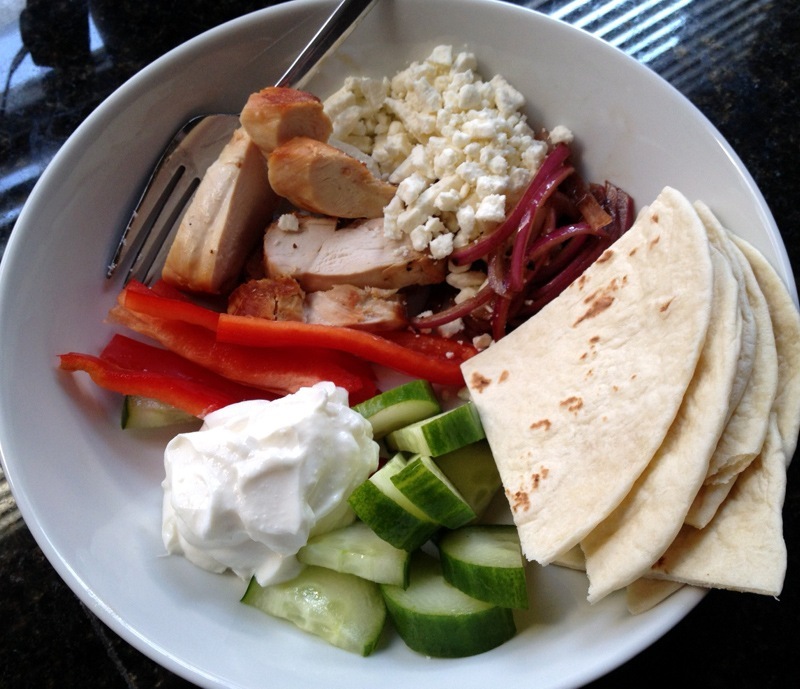 All that’s left to do to make this dinner night of is to warm the chicken, cut up the flatbread, dollop on the greek yogurt, and sprinkle on the feta. Create any number of combinations on top of the flatbread and enjoy. No brainer, right?! Next Day Trip to Salem, Mass. I would love to be able to give it up but I know it’s not ever going to happen for me. TJ’s makes a whole wheat version of those pitas too. Nope, it’s surprisingly easy. Enjoy!